The Rio de la Plata flows south forming a border between Uruguay and Argentina and then opens into a large bay. Buenos Aires and Montevideo (photos) sit on opposite sides of this bay about 130 miles apart, Montevideo being to the east and a little south of Buenos Aires. The easiest way to travel from one to the other is over water since the land route is quite long. We utilized a combination boat/bus service called Colonia Express. From our apartment, we took the subway to a point closest to their dock then took a taxi for the final 8-10 blocks. Before leaving, our passports were stamped out of Argentina and into Uruguay. The boat trip was about 1 1/2 hours across the bay to the city of Colonia, Uruguay. From there we boarded a Colonia Express bus for a two hour ride to Montevideo ending at the Tres Cruces bus terminal. Finally, a taxi ride took us to our hotel in the old part of the city, the Cuidad Vieja. Montevideo is by far the largest city in the rather small country of Uruguay, with a population of 1.3 million representing over half of the total for the country. The historic old city with its art deco and neo-classical buildings occupies most of a peninsula that juts out into the bay with a protected harbor on one side and the other side facing eastward to the open bay and the Atlantic Ocean beyond. Bridging the old city to the newer part is Plaza Independencia with its monument to Jose Artigas, considered to be the father of Uruguay’s independence. His remains are housed underneath the plaza in a rather elaborate vault. The city has many beautiful buildings, some of which are alongside some truly awful looking 1970’s and 80’s style structures. As we walked around we kept finding more buildings we wanted to photograph. 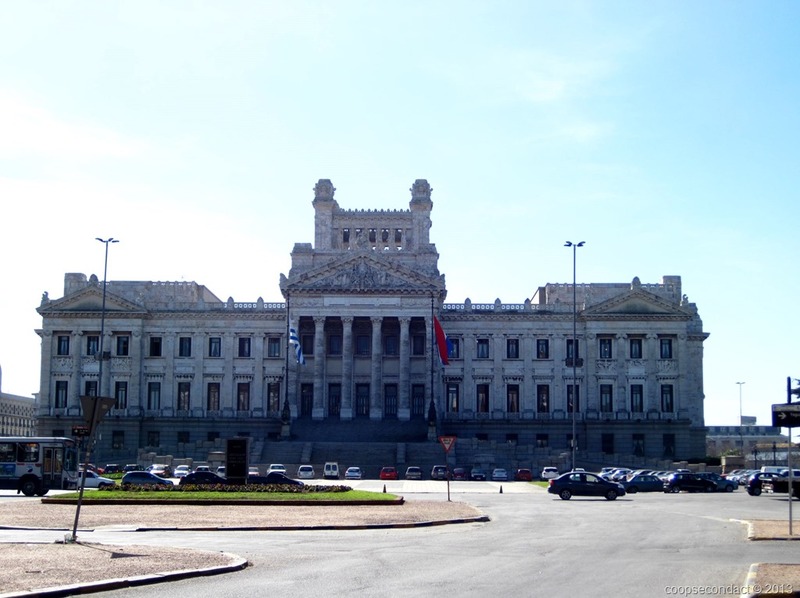 One very impressive example is their congress building, Palacio Legislativo with its design inspired by the U.S. Capitol building. 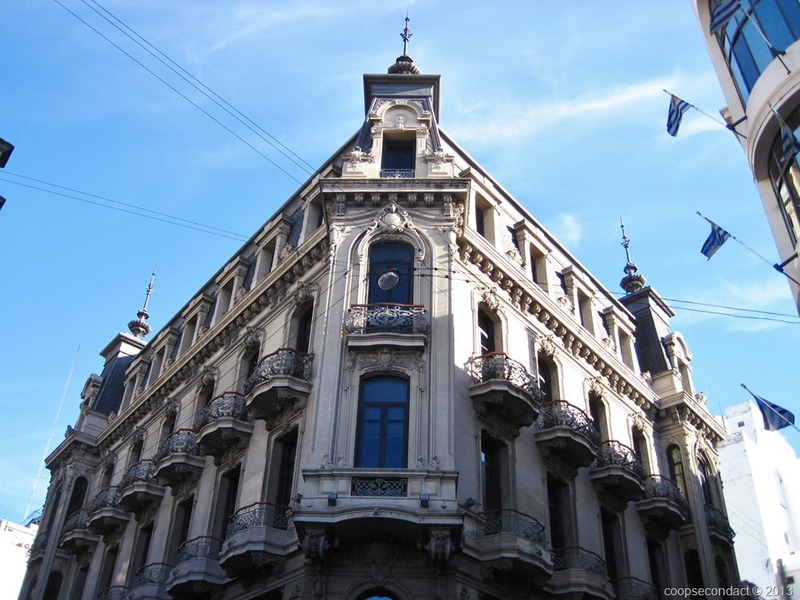 Another beautiful building that we were able to tour is the Teatro Solis, the premier performance space for Montevideo. It was opened in 1856 and has undergone renovation in more modern times. The design of the main room was inspired by the La Scala theater in Milan, Italy. 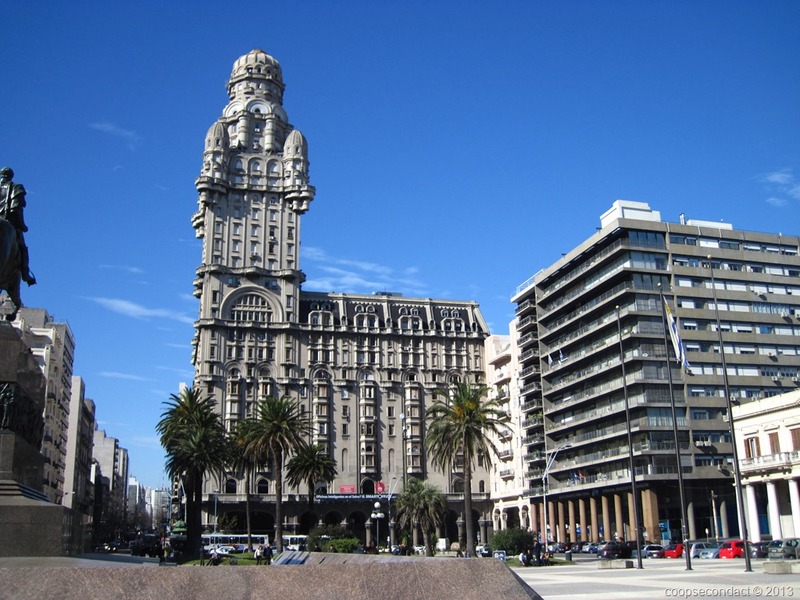 Montevideo is accustomed to playing second fiddle to Buenos Aires. Most people, like us, visit there as a secondary priority while giving more attention to BA. We spent three nights here but would welcome the opportunity to return.